AT3-310 Automated Programming System | FALCON DENSHI K.K. 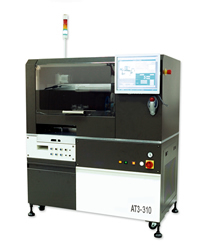 AT3-310 is a professional multiple pick & place auto programmer for ICs on / in tray, tube and tape. System provides intelligent operation for IC programming/testing, tape-out-marking and packing conversion with powerful software control. The resident Programming Units offer efficient and reliable multi-site IC programming. Optional tape-out-marking is available after programming. A variety of I/O devices can be mounted and changed easily providing flexibility of input / output options basing on IC packing form. System handles 4 units each pick & place thus improve throughput up to ~2200 UPH for ICs with programming time less than 38 sec. ■Excellent performance --- The system can operate a variety of input and output options with tray, tube and tape I/O devices thus provides programming/testing, tape-out-marking and packing conversion for most of IC products on / in tray, tube and tape. ■Intelligent operation --- Automatic multiple pick & place operation in sequence of IC loading / pickup / positioning / insertion / programming / sorting / optional marking / unloading with powerful software control. ■Accurate positioning --- System is equipped with two precise CCD. One fixed, upward CCD for IC positioning while the other carried, downward CCD for sockets / pick & place spots positioning. ■Reliable programming --- The built-in programmers, ALL-100AX / FLASH-100 series, are designed with high speed CPU, resided FPGA, high capacity pin drivers and USB interface, thus providing a high speed, low noise, stable and reliable programming platform. ■Multi-site programming --- Programming Module may have 1, 2, 4, 6 or 8 sockets on board considering programming time. Up to 8 sites x 4 sets = 32 sites can be programmed simultaneously, thus eliminating / minimizing handler idle time when programming high density memory devices. ■High throughput --- ~2200 UPH, about 6.4 sec. handler index time for each 4 units of pick & place. System offers ~2200 units / hour consistent throughput for ICs with programming / testing time less than 38 sec. ■Optional marking --- System provides optional dot / alphanumeric tape-out-marking after programming / testing. ■Easy change-over & maintenance --- Easy and fast change-over of socket modules and I/O devices when switching IC products among tray, tube and tape. Power-on self-diagnostics, I/O Mode utility and module design allow system easy for maintenance, repair and replacement. ■Powerful operation software --- Both setup data and test results are automatically saved for next power-on operation as well as for quality / yield traceability. Graphical user interface makes it easy to access. For demo and programming factory tour, please feel free to make a request from inquiry form.